Stewardship aids in the development and maintenance of our Church and more specifically, it supports a life in Christ. It is a prayerful commitment that each and every Christian makes in order to support the Church Community. The burden of giving falls on all of our parishioners. It is a personal, prayerful commitment and is the responsibility of each parishioner. 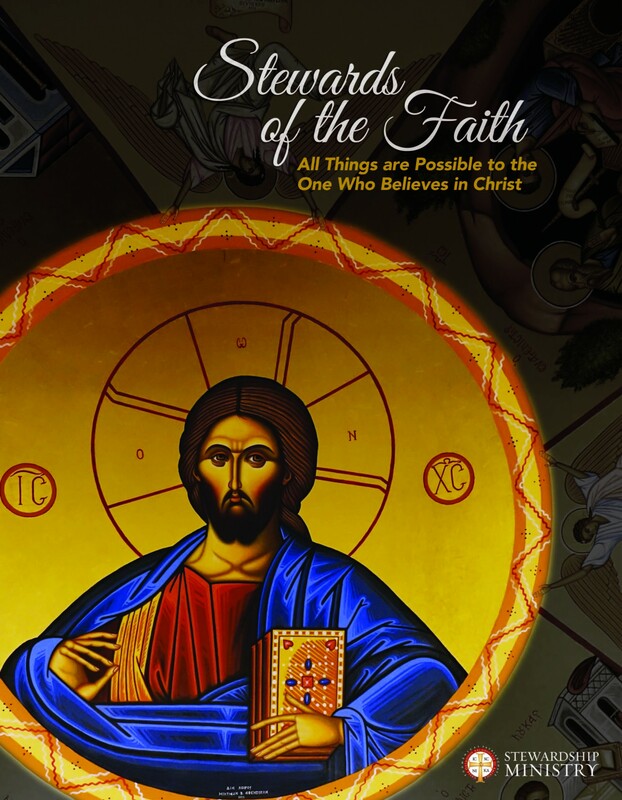 Stewardship supports the Orthodox Christian practice of the consistent giving of time, talent and treasures in support of our Church and in furthering the word and teachings of Christ. Stewards are encouraged to contribute their time and talents by volunteering in the numerous community and ministry programs that are supported by the Annunciation Greek Orthodox Church, attending church services and participating in church activities. Parish families are also expected to pledge a proportion of their financial treasure toward the Church and its ministries by participating in the annual pledge drive that begins each fall. Stewardship is personal responsibility for taking care of another person's property or financial affairs or in religious orders taking care of finances. Fiscal stewardship refers to the practice of assuring that current spending programs are affordable and sustainable over time. In an organizational context, stewardship refers to a responsibility to properly utilize and develop resources, including people, property and financial assets. Financial stewardship is based on the belief that God is the true owner of each person's possessions, and that one is accountable to God for the acceptable care and use of those possessions. According to the Bible, a Steward is one who manages the gifts entrusted to him for the perpetuation of the Lord's work. Our money and possessions are not ours, but on loan. When we give to the Church, we return to God, the Owner, His rightful portion. The more we are given, the more that is expected of us. "Those to whom much is given, much is expected." Each Sunday, we should prepare to make our Stewardship contribution to the Church in accordance with the Lord's generosity to us personally. Supporting the Church should be a priority for every Orthodox Christian and performed on a regular and consistent basis. Consider how your expenditures on personal entertainment compare with your Stewardship pledge. Is your Stewardship simply a token donation? Or is your Stewardship pledge a meaningful response to Christ's request of you? Christian Stewardship and total commitment are Orthodox! It is not just giving of our time or our talents or our treasures. It is, rather all three! Stewardship is koinonia ... it is fellowship ... sharing together in the body and blood of Jesus Christ. Stewardship is also martyria ... it is witnessing for Christ to others. Christian financing is focused upon the soul and giving as we have been blessed. Therefore, total and true Christian Stewardship is where we are aware of all three of these elements - time, talents, and treasures and giving of ourselves to do as Christ instructed us to do, to be caretakers and defenders of His Church here on earth with all of our energies and abilities. Money is a necessary tool for ministry. The Church's mission of salvation and evangelism depends directly on your generosity, which supports our Parish and Diocese. We should not continue to depend on special affairs to meet our budget. The growth of our Faith and its dissemination is our own personal responsibility. Stewardship places the responsibility where it belongs, directly upon us.